Nutrition tends to be at the center of many of the cure your cancer quick promises. And as well-meaning as your aunt who found an article that says, if you just eat this one native plant from Southern Yucatan then you too will be cured of prostate cancer, might be, you will be hard-pressed to find any evidence that it will help you at all. But fear not – though there is no food you can eat that will cure you of cancer overnight, there are plenty of diet adjustments that are scientifically proven to have positive effects for men with prostate cancer. Eat! Between the side effects of certain treatments and the stress that comes along with a cancer diagnosis, you may experience loss of appetite. However, it is important to fuel yourself with nutritious, unprocessed foods as your body deals with cancer and treatment. Avoid Processed Meat. Several studies have shown a link between processed meat consumption and advanced and lethal prostate cancer. If you already have prostate cancer, please do not stubbornly insist that the damage is done, so you might as well go on eating all the pastrami you want. There is considerable evidence that processed meat increases the risk of chronic disease and death overall, not just for men with prostate cancer. It’s never too late to make healthier choices. Cook Meat Low and Slow. You may have heard that charred meats are carcinogens and should be avoided. In fact, the risk is with any meats that are cooked at a very high temperature, not just those that have char. Meats cooked at a high temperature produce a carcinogen called PhIP. This is true for all meat, not just red meat. So, cooking your meat low and slow can reduce the cancer risks associated with meat intake. Remember, like all things, moderation is key – this does not mean eat all the meat you want so long as it’s cooked slow. Get Your Vitamins from Vegetables, Not Supplements. If you’re in the habit of taking a daily multivitamin, don’t let this discourage you. But if your pantry has become an apothecary of supplements (no matter how “natural”), let us be the first to tell you that there is a better way. 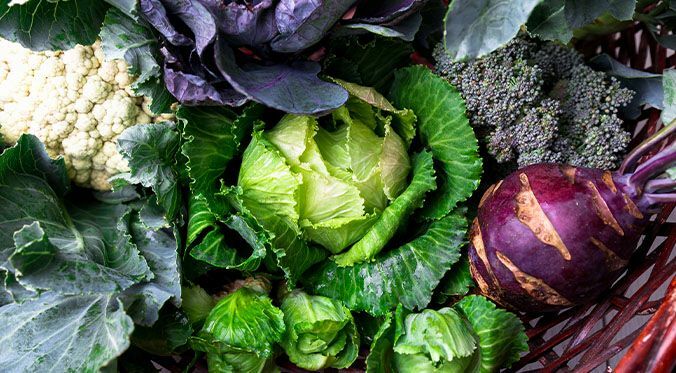 Eating a hearty serving of vegetables might not be as time-efficient as popping some pills, but the benefits are numerous and it will give you a head start on our next tip. For more in-depth diet and lifestyle recommendations, download our nutrition guide here. To join our monthly recipe club, sign up here.